*Imagine the torture of being among the only people in Cleveland unable to watch Game 7 of the NBA finals because you’re anchoring a live newscast at the same time. Such was the case with the news team at Cleveland’s Fox affiliate WJW, forced to do a 10 p.m. newscast – that they had to know no one was watching – as LeBron James and company were on another channel making history. 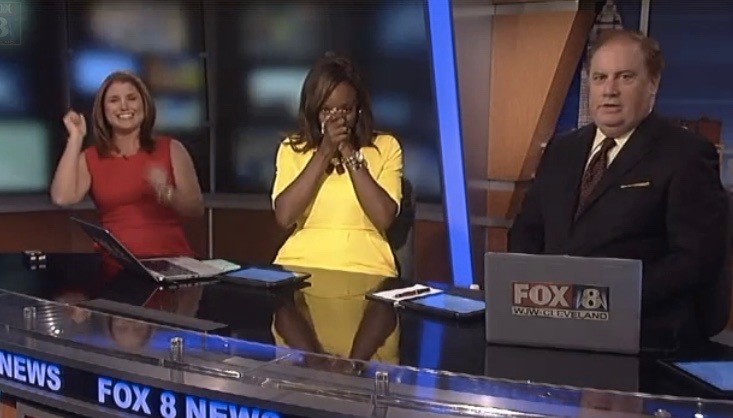 Once the Cavs won, however, all other news took a back seat as the three anchors react live to the end of their city’s 52-year championship title drought. Watch below as they appear to want to jump out of their chairs, run around and scream, but are forced to remain professional.